We’ve been experimenting with word problems as integrated math and English Language Development. Students read the problem, solve the problem and then do a write-up of the problem. It takes about a period to do 2-4 problems (for similarity, some groups finished one; most groups got to 3 for right triangle trigonometry). This might be different for mainstream classrooms, but I’d be curious. In contrast to activities like stations or explanation quizzes which encourage students to practice a range of problems, word problems feel like they allow students to dive deeper into problems. It’s also curious to watch students mistake “the ground” in a word problem for “the line in the air”. I’m not sure if that’s a case of mis-translation or not reading the directions or something else. Gotta shout out Curriculum Partner on this one, since they wrote the word problems. Teaching 9th and 10th grade recently arrived English Language Learners is interesting. They often spend the first bit of time being confused – there’s a lot of English and the cognitive demands of high school in the US feel like they’re probably a bit higher than some of their prior schooling. But at some point during the year, they start to speak more English, they start to ask more questions, they start to write more things down. This kiddo has recently become more active. I suspect it’s in part because we’re using scientific calculators (the non-fancy graphing ones for you following along at home) and this kiddo likes using them and feels successful at using them. 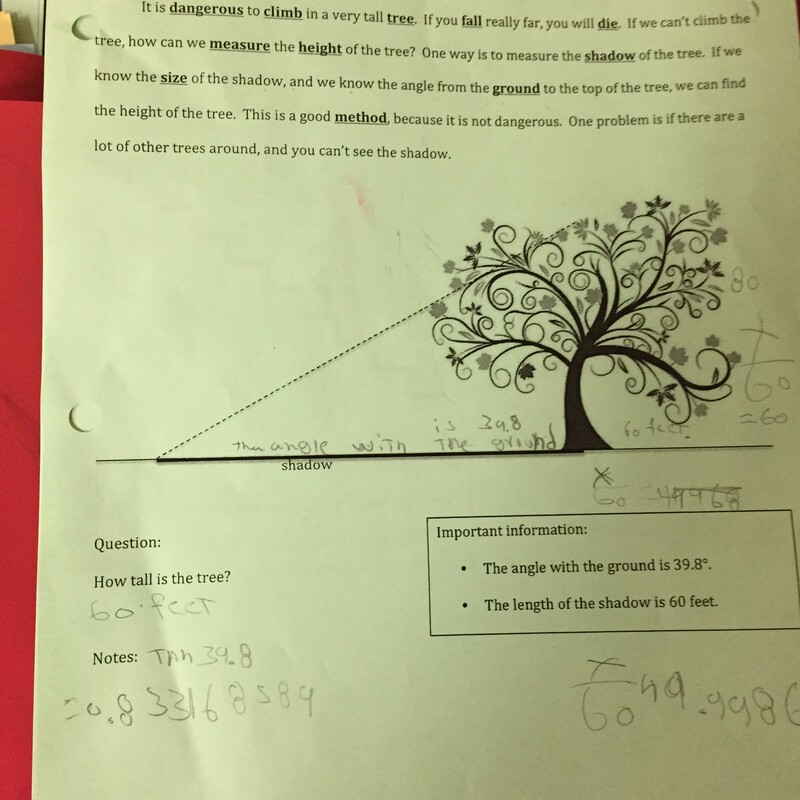 At any rate, this kiddo was able to find the tangent of the reference angle (39.8) and label the unknown height of the tree as x. I think they also know that the shadow (the adjacent side of the triangle) was 60 feet, though their label is a bit misplaced. Related, but unrelated: I completed my first Educational History Inventory. Don’t get too excited; it’s just a series of questions about how long a student has attended school for prior to arriving at our school. The vast majority of our students, especially those who arrive without documentation, do not bring transcripts or school records, so it’s hard for us to know if they’ve missed school in the past (something we call Interrupted Formal Education). To be fair, when I asked one student about their transcript, they said “well, my principal got shot, so…”. And I certainly wouldn’t count my transcript as the most important thing to bring with me from my home country. At any rate, I’m actually finding that quite a few students who I suspected had Interrupted Formal Education have been in school continuously, which is leading me to think more about the transition to United States high schools and how we accelerate the growth in English process.